The Hidden Pivot Calculator in on two pages. One you can access via the link above and one in the Chat Rooms. It works the same in both areas except the link above takes you to a fixed page version of the calculator that can’t be moved. 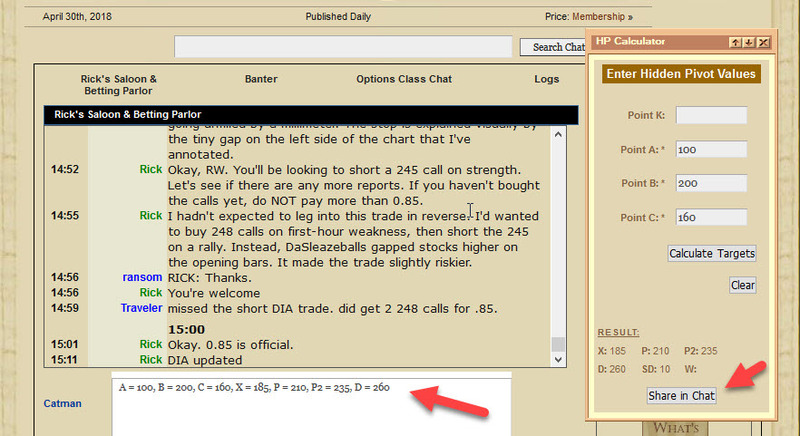 In the Chat Rooms, you can Click HP Calc in the Chat Room menu to display. This HP Calc Window in the Chat Room opens in a small window and can be dragged anywhere on the screen. If you stay in that Chat Room, the window will remain in the position you set it at, even if closed and re-opened. Click in the header of the small window where “HP Calculator” is displayed and drag the window to where you want it. Click X to close. The calculator can be moved anywhere on your screen. You can then enter your values in. Press “Calculate Targets” and the calculator will display the calculated values. If you want to enter the pattern values into the chat message box, click the Share in Chat button, and the values will be entered into the message box. You can then add any other text to the box. There is also a HP Calculator in Excel format in your Account Dashboard, under “Active Resources”, which you can download to your computer. Browser quirks – If the HP Calc menu Item wraps itself around to the second line, enlarge your browser a bit larger user the mouse wheel or whatever the method your device uses to widen the browser window. If in your browser the HP Calculator appears with scroll bars, enlarge the window with your mouse cursor until the bars disappear. Usually pulling the top part of the window up will enlarge it easier. If the calculator does not appear right or allow entry, refresh the browser page and/or Reset the cash on your browser in the Internet tools. This should work for any browser to display it properly. 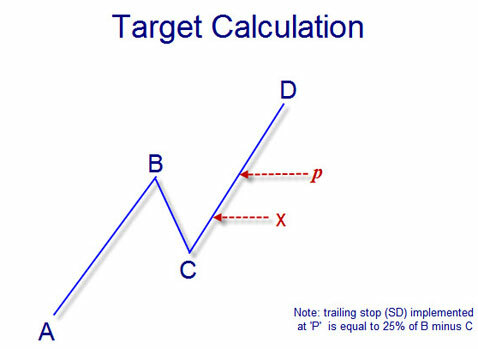 In Target Calculation, it allows you to enter the A,B, and C values of an HP pattern and when you click Calculate Targets it will display the X Entry, P and D. SD is no longer used by Rick. He states that the “SD means ‘stop differential. It is the trailing stop calculated as 0.25 times the BC leg, and it is activated at P. In practice we now use impulse leg – based stops instead. In 40 years of trading I have not found a better or easier way to manage risk.It helps avoid getting stopped out needlessly. 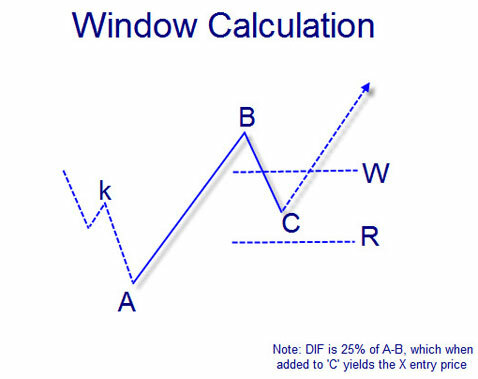 In Window Calculation, when you enter your k value it calculates your HP Pattern window values W, R and DIF. DIF is 25% of A-B. DIF is not used by Rick anymore. Take the HP Seminar to see what all these values mean. Clicking Reset will reset all entered values so you can re-enter another set. This HP program will only run on computers or a device running a current flash plugin. If you don’t see the HP Calculator in the window that opens, install Flash from Adobe onto your computer. Flash does not run on an IPAD. If you prefer, you can download a Microsoft Excel version of the Hidden Pivot Calculator. If you wish to learn more about the Hidden Pivot method, see the Hidden Pivot Method Course page where you can sign up to take the Hidden Pivot Course and shows the dates when the webinar will next be offered.